Many individuals, like this GFA-supported worker, greatly desire to see churches built so people can worship God freely. Sweat dripped down Ekansh’s body as he dug a shovel into the ground. Earth begrudgingly gave way to his labors. But despite the difficulty, Ekansh and several others labored with joy. They had prayed for years without seeing any hint of change, but now God’s answer was impossible to miss, an answer that had started long before they ever moved a shovel full of dirt. Ekansh was among the many who endeavored to crowd into a small mud-and-tile house for Sunday worship. But when it was hot, people didn’t always want to go. In fact, many believers didn’t make it to every service because of the extreme temperatures. Without the consistent teaching from Scripture and times of corporate prayer and worship, these men and women struggled to grow in their walks with the Lord—especially those who were illiterate or didn’t have a copy of the Word to read on their own at home. The people depended on the fellowship for growth and encouragement, but the fellowship struggled to meet in the summer heat. The rainy season was no better, as the small house leaked water onto the heads of the worshippers, dampening clothes and spirits alike. It’s easy to romanticize house meetings in rural places or church meetings under a tree, but this was no picnic. So the people prayed. 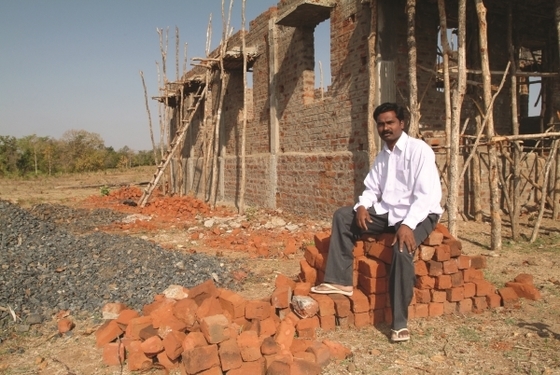 They and their GFA-supported pastor, Brijesh, asked God to provide them with a piece of land and supplies to build. And He did. He put it on the hearts of people in the congregation to give what they could, and He moved in the hearts of men and women around the world to contribute the remainder. When the congregation found out God had answered and they could go forward with construction, they got very excited and broke out in spontaneous praises to God! From February to October, the congregants labored together. Some donated materials like sand and bricks. Others, like Ekansh, helped with the physical labors of digging out the foundation and levelling the floor. What they couldn’t provide, the donations of others supplied. And for anything they couldn’t build, hired hands did instead. In October, with the cutting of a ribbon and much rejoicing, the new building was inaugurated. And for a 25-year-old man named Sidak, who watched all this unfold, the start of this church building marked the start of a change in his life, as well. On the day of the building’s dedication, Sidak decided to show up. He hadn’t been invited by any human hand, but God drew him there that day. As Sidak watched the ceremony, listened to the teaching and heard the songs and prayers, peace settled into his heart. Since that day, he started attending the worship services, where the peace of Christ made a permanent change in his life. But Sidak and Ekansh aren’t the only ones who have been blessed through this building. Many others now have the opportunity to attend services, regardless of the weather. Rain or shine, believers can gather to grow in their relationship with the Lord.